BREAST cancer is the most common cancer in women in the north. Every year 1,200 are diagnosed and 300 lose their lives. Cancer Focus NI has been funding research at Queen’s for a number of years and has just launched a new campaign – In Pink – to encourage the public to do something pink to help them continue their work into this devastating disease. South Belfast mum Debra Rice is a BRCA 1 carrier, which means she has an 85 per cent chance of getting breast cancer in her lifetime. Debra said: “My dad’s two sisters died at a young age from breast and ovarian cancer so I’ve been attending a family history clinic at Belfast City Hospital for regular check-ups for the last nine years. “As I got older I could feel the fear building before each appointment. “I was called back last August after a routine mammogram. I wasn’t overly concerned as this was the second time I’d had a call back. I had more tests including an ultrasound and biopsy. The doctors thought there was something there, which was later confirmed to be cancer. Debra continued: “It was only at this point that I was tested for the BRCA 1 gene fault, which came back positive. I also had triple negative breast cancer, which is very common with BRCA. I got the confirmation in September, I had a double mastectomy in October followed by six cycles of chemotherapy. Last March I had a hysterectomy. Debra says that although it was a very difficult time, the decision to proceed with surgery was an easy one. 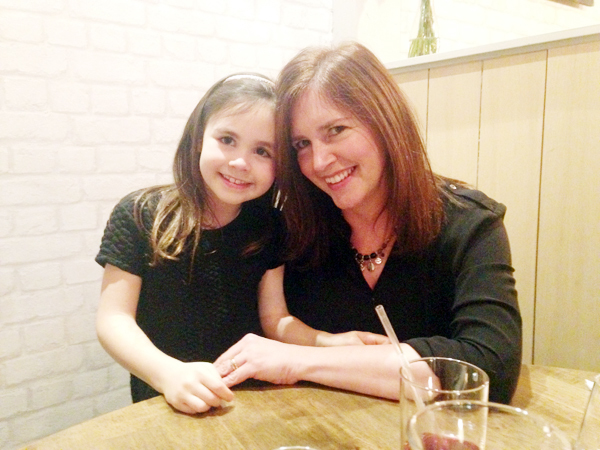 “Once I was confirmed a carrier the decision to have preventative surgery was a no-brainer. I had to do whatever was needed to get my risk of a recurrence as low as possible. It was always on my mind whether or not I had the gene but once I had cancer I wanted to move forward as quickly as possible. “I wasn’t most afraid of the mastectomy, I was fit and otherwise healthy and was confident I’d make a good recovery. I was able to pick Emma up from school less than a week after that surgery. “It was the chemo and losing my hair that was the big hurdle for me. It was just three weeks after my first cycle that my hair started coming out in clumps. I thought I couldn’t be doing with that so I went to my hairdresser and got it all shaved off. That was a big moment, that is when I really cried. “In January I was well enough to be able to go back to work two days a week – my employer was extremely supportive, it wouldn’t have been possible without that. I am feeling great. My surgery is very much in the past and I’m only looking forward – onwards and upwards. “I had a great chat with the geneticists, my concern now is that I have an eight-year-old daughter. She has to be at least 18 before she can be tested as she has to take that decision herself. That is a conversation that we will have to have when she’s a bit older. If you’d like to organise an In Pink event, get your fundraising pack at www.cancerfocusni.org, call the fundraising team on 028 9066 3281 or email fundraising@cancerfocusni.org. If you’re worried about cancer call the Cancer Focus NI free Nurseline on 0800 783 3339.